The MagnaShear marine duty motor brake from Force Control Industries will be featured in booth #1862 at the International WorkBoat Show, from December 3-5 in New Orleans, La. These proven brakes employs oil shear technology, providing longer service life even in demanding applications like the frequent start/stop cycles seen on cranes, hoists, winches and other marine material handling equipment. High grade castings, marine duty coatings, stainless steel fasteners and accessories make these brakes an ideal solution for onshore and offshore crane applications. Proven oil shear technology transmits torque between lubricated surfaces – thereby eliminating wear on friction surfaces. A patented fluid recirculation system dissipates heat – eliminating heat build-up which is the most common problem in dry braking systems. Elimination of the wear significantly increases service life and virtually eliminates adjustment which also elongates maintenance intervals. They are suitable for applications where the motor is reversed each cycle such as cranes, winches and hoists as well as loader/unloader conveyors. The totally enclosed MagnaShear brakes are impervious to moisture, dirt and dust that is common in concrete block plants as well as asphalt shingle manufacturing, coal, bulk materials handling, forest products manufacturing and more. MagnaShear brakes with oil shear technology provide longer service life, characterized by virtually maintenance-free operations, the manufacturer said. These motor brakes are available to accommodate a wide range of applications. Spring set torque ratings from 3 to 1,250 foot-pounds are available. 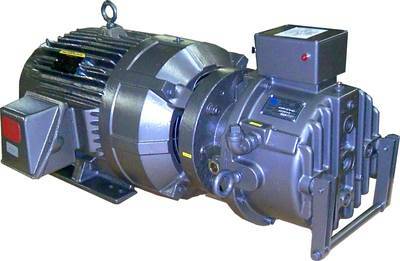 MagnaShear motor brakes can be sized to the correct torque independent of the motor frame size or horsepower. MagnaShear motor brakes feature “quick mount” features for quick and easy mounting to drive motors in NEMA frame sizes 56 to 449. They are shipped ready to install, with no assembly or adjustments required. They are also available pre-mounted on a motor for severe duty applications. MagnaShear motor brakes can be furnished to fit a NEMA or IEC frame motor, as a complete motor and brake assembly, or to mount on a machine frame or other special mounting configuration. The motor brakes are totally enclosed from outside contaminants, with seal integrity for harsh fresh water and saltwater environments. A modular design /assembly allows for ease of servicing and maintenance.